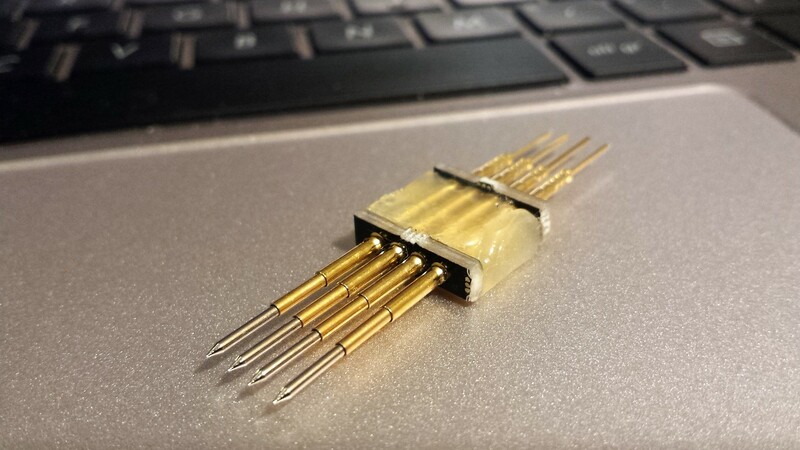 In most DIY projects where pogo pins are used people solder them directly to a wire or pad on a PCB. Despite it looks like it is the way to go, it isn’t. Pogo pins tend to wear out relative quickly as they are only rated for a couple of hundred ‘compressions’, also solder can sip into the pin and ruin its spring. The proper way is to use matched sockets, which allows quickly replacing wore down pogo pins. They come in two variations: wirewrap (or PTH) and directly solder able. The socket has a also a ‘bulge’ to keep it secure in place. By using the excess PCB estate I created some common ICSP/debug arrangements: 2×5 (JTAG), 1×5 (Microchip ICSP) and 1×4 (serial, SWD). 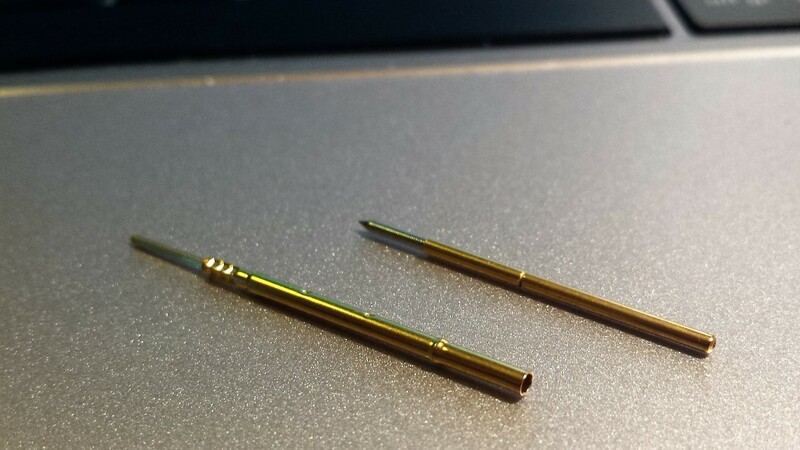 The holes have a diameter of 1.7mm, which is a bit thicker then the pin diameter, but smaller then the bulge. The pogopin is fixed to the PCBs by blobs of hotglue. Optional some heatshrink tube can be applied. I got my pins in directly from a manufacturer in Shenzhen but you can get them per 100 from here. Also the mechanical drawing are provided there. Can you please let me know where you bought those pins? ( the manufacturer’s contact). I thought about doing a test jig for CPU with about 26×26 pins. Do you have any experience with such large jigs? I got them on one of my sourcing trips in Shenzhen. The manufacturer is located in SEG market, 3rd floor. Unfortunately I have no businesscard, but many stores there sell them. You can find lots of variants of these on taobao. It seems like it’s common to use two standard M3 standoffs to give the whole thing some rigidity. And then heatshrinkwrap the whole thing. I really like these for developing / debugging https://world.taobao.com/item/534058232548.htm they have the right amount of springy-ness. 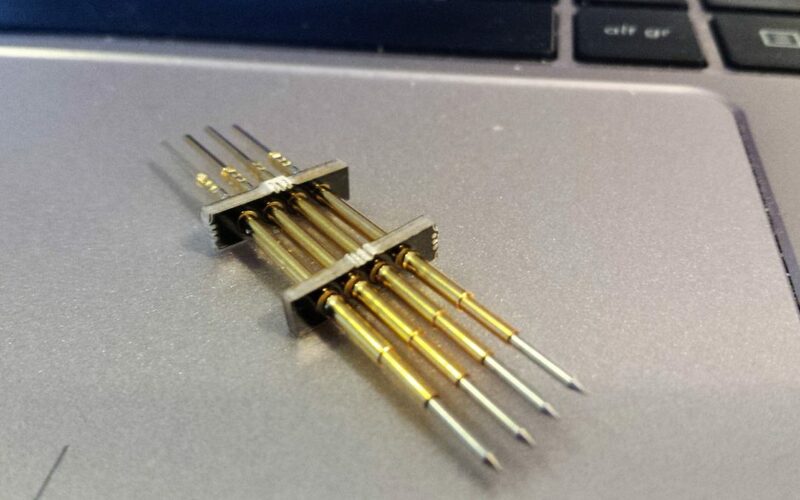 You can just clamp them on your test/debug port on the edge of your pcb and leave it connected. I remember seeing those clamps in HQB. They are soo sweet. Thanks for the links and translation!